The teams from Groups C and Group D took a rest on day three of the 2014 FIBA World Cup, allowing the teams from Group A and Group B to bask in the limelight. Much of the focus was placed over to the host nation but by the end of the day, it was likely that most basketball fans were talking about shocks and near-upsets. When it comes to World Cup Basketball betting, day three was a fairly interesting one. In the match between the two top teams in Group A, the host nation lived up to their billing as second favourites for the tournament and squeezed past Brazil in an entertaining encounter. It was a tighter match than Spain’s first two games but with three wins out of three, Spain will be looking to maintain this momentum as long as they possibly can. The 82-63 win was a fair reflection on the match. Once again, Pau Gasol was the main man for the Spanish side as he picked up 26 points and also delivered 9 rebounds. The Spanish side got off to a blistering start that blew Brazil away, with the match never really recovering as a contest after that. France have been involved in two tense matches so far in the 2014 FIBA World Cup, so they would have enjoyed a more straightforward and routine victory Egypt. The 94-55 win for France saw Joffrey Lauvergne pick up 12 points and 7 rebounds while Ibrahim El-Gammal was the star man for Egypt, delivering 12 points, 4 rebounds and 3 assists. The Serbia versus Iran match was probably closer than many people expected even if the 83-70 victory for Serbia was exactly what most people tipped. Hamed Haddadi caused all sorts of problems for Serbia, and his 29 points was a highlight of the game, even if it wasn’t enough to give Iran a victory. Nemanja Bjelica grabbed 18 points and popped up with 10 rebounds for the victors although a great deal of credit should be given to Miroslav Raduljica, who picked up 13 points in just 17 minutes of court action. With three games of the group gone, and all of the sides enjoying a rest day on Tuesday the 2nd of September, the group is taking shape. There will be no surprise at Spain topping the group, or holding a 3-0 position, on 6 points. France, Brazil and Serbia are all tucked in neatly behind on 5 points, while the minnows of the group Iran and Egypt, lag behind on 3 points. At the moment it may be going to plan, but one shock result could blow the qualification spots open. These games could break the bottleneck in the qualification places and both Egypt and Iran know that this is the must-win game if they are looking to break out of the bottom two slots and stay on in Spain for a longer period of time. 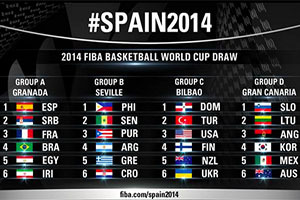 The day of rest will be welcome because this is shaping up to be a pivotal day in Group A of the 2014 FIBA World Cup. When it comes to romantic stories in the FIBA World Cup, Senegal may be winning the hearts of basketball fans from all over the world. An opening day loss has been shrugged off and after a win over Puerto Rico, Senegal has caused a major stir by beating Croatia 77-75. Gorgui Dieng, from the Minnesota Timberwolves, was once again the main man for Senegal as he delivered two blocks, eight rebounds and a stunning 27 points. Croatia has two NBA stars delivering 15 points each, Dario Saric and Bojan Bogdanovic, but this wasn’t enough to seal the win for the European side. That was a big shock and there was almost another massive shock in another game of Group B. In the end, Argentina held on to defeat Philippines 85-81, but it was as close as the score line suggests. Luis Scola was once again the Argentine hero, with 19 points, but the form of Raniel de Ocampo, with 18 points, and Andray Blatche, with 14 points, almost turned the game in the favour of the Philippines. In the remaining game, the 90 – 79 win for Greece over Puerto Rico almost seems dull in comparison but it was a game that was brought to life near the end with Puerto Rico putting in one last push. Nikos Zisis delivered 19 points for Greece while Renaldo Balkman was the star man for Puerto Rico with 23 points. After three games, we have Greece on top with a 3-0 position and 6 points. We then have three teams on 5 points, all with a 2-1 position, with these teams being Croatia, Senegal and Argentina. The two bottom spots of the group are held by Philippines and Puerto Rico, both with a 0-3 record, and 3 points. Much like in Group A, the minnows of Group B know that they have to win their game and then see what unfolds in the other group to determine what sort of chance they will have going into the final group game. All three of the games will have plenty to offer, although all eyes will be on Senegal to see if they can cause another massive shock and place themselves firmly in the frame to progress to the knock-out rounds. The Dominican Republic versus USA game may be one of the biggest mismatches at the 2014 FIBA World Cup, but you can bet that the Spanish crowd will be roaring on the underdog with all of their might. This should be another routine victory for the Americans which mean that the other two matches may be more intriguing. At the time of going to press, these teams had only plated two games each so the results of Tuesday the 2nd of September, may have an impact on how crucial the games of Wednesday the 3rd of August are. The games on Wednesday the 3rd of August in Group are the middle games of a three day stretch, and all of the teams will be battling for the win that could secure their place in the play-off round. Once we get beyond this round of fixtures, the action heats up with the final day of the group stages, which may be the equivalent of a shoot-out for some teams. This is when the 2014 FIBA World Cup truly comes alive!